A country of harsh extremes, Afghanistan lies in Central Asia between Pakistan and Iran. The country has rugged, snow covered mountains and arid deserts. Summers are hot and dry, while the winters are cold. Farmers grow food in the fertile farmland between the mountains. For over 2,000 years, traders passed through the mountain passes along the Silk Road between China, India and Europe. The country was settled more than 9,000 years ago and has been conquered many times. The Greeks invaded in 330 B.C., followed by the Mongols in 1747. The British sought to conquer Afghanistan, but were finally defeated in 1919. The Soviet Union arrived in 1979, and left almost 20 years later, in 1996. The U.S. invaded Afghanistan after the terrorist attacks of 2001, along with other countries, to remove the Taliban from power. 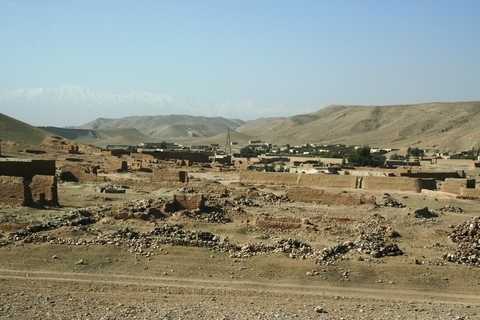 Afghanistan continues to endure war and conflict. The continuous years of war have left the country in shambles. Children attend bombed out schools that are falling down. Children sometimes step on unexploded land mines left on the ground. 32.4 million people live in Afghanistan. The country has 250,000 square miles of land. The official languages include Pashtu and Dari. Islam is the official religion in Afghanistan. The life expectancy in Afghanistan is 44 years. Visit National Geographic to learn more about Afghanistan. Question: What do Afghan children do for fun? Answer: Life in Afghanistan isn’t always hard and dreary. Afghans – including children – love to fly kites. Sometimes they have kite competitions. The kite flyers attach metal or glass to their kites to cut the strings of their competitors. Declan, Tobin. " Fun Afghanistan facts for kids ." Easy Science for Kids, Apr 2019. Web. 24 Apr 2019. < https://easyscienceforkids.com/afghanistan/ >.